How do you bring the USDAC to your community? Start a USDAC Outpost! People across the U.S. have told us they want easy ways to connect locally through the USDAC for support, sharing, and collaboration. That’s why we started a national network of local USDAC Outposts. An Outpost is a group of four or more individuals committed to enacting USDAC values in their community. Connect locally to other Citizen Artists committed to USDAC values. Access USDAC technical and strategic assistance in local cultural organizing. Be a part of a national network that learns from and with each other. See your local efforts amplified on the USDAC platform to shift culture toward equity, empathy and belonging. A start-up Toolkit with resources, information, and ideas to help you jumpstart an Outpost and set your own agenda of learning, relationship-building, and action. A batch of USDAC swag, and official Outpost certificate. A listing on the USDAC website. Support from the USDAC Office of Instigation in taking part in National Actions and in formulating your own projects and plans. Access to Action Network to create your own e-list, send out eblasts, track activists, create petitions, actions/events, forms, fundraisers, and more. Fiscal sponsorship and support in applying for funding for Outpost activities and projects. Opportunity to apply for micro-grants from the USDAC. Regular online video calls connecting Outposts with each other and with experienced USDAC organizers. Complete a jumpstart project in the Outpost’s first six months. Take part in USDAC National Actions in ways relevant to local needs and resources. Keep the USDAC informed of Outpost activities so we can help promote them. Take part in video calls to stay connected with the USDAC network. Scroll down to download a Toolkit that tells you how to (1) jumpstart your Outpost; (2) set your own agenda of learning, relationship-building, and taking action through USDAC National Actions and local projects and campaigns; and (3) connect with other Outposts everywhere. Have a look, and then complete your Outpost application below. We'll get back to you within two weeks of the deadline. Applications Open TWICE/year. The next deadline is coming in Spring 2019! Got questions? Check out our Outpost FAQs. If you’ve never taken part in a USDAC action before and/or aren’t clear how being an Outpost in the USDAC network could be an asset to your cultural organizing, feel free to be in touch with our Minister of Collaboration and Activation, Gabrielle Uballez: gabrielle[at]usdac.us. We’re glad to have a conversation before you consider applying. We encourage Outposts to take on one of the following the missions in their first six months. Each mission has measurable aims and can be accomplished with the time and effort noted. Each will enable you to learn more about potential participants and allies and assess community needs and interests as you go. Recruit 10 local organizations to take the pledge to #HonorNativeLand, joining hundreds of others who have already acted to acknowledge the Indigenous people who’ve lived in the area where their events are being held. Or start a petition targeting a local public or private organization, urging commitment to regular acknowledgment. (Read all about this initiative and download the guide here.) Working with a team of four, you should be able to secure pledges in less than four hours apiece; a petition campaign can succeed with a team of eight investing eight hours each. Host a Story Circle event, and support three other individuals or organizations to do the same. Since 2015, based on the conviction that democracy is a conversation, not a monologue, the USDAC has been inviting people to share their stories and using them to inspire artists and policymakers. Every winter, the USDAC invites everyone to meet in a home, school, house of worship, or other space to share stories in the People’s State of the Union. If the time isn’t right for PSOTU, focus the four Story Circles on another USDAC National Action such as #RevolutionOfValues, or on any issue or opportunity that would benefit from truth-telling and deep listening. Working with a team of four, planning, promoting, and hosting a Story Circle should require less than six hours apiece; supporting three other Story Circles should add three hours apiece. Form an Artistic Response Circle, preparing yourselves to offer care and consolation, support creative protest, or help build community resilience in the event of natural or civil disaster. It’s about readiness: your circle can research and connect with potential partners in the arts community and among emergency management agencies, create an alert system to mobilize creative response, plan scenarios in the event of a natural disaster or civil emergency, and be ready within six months to respond to whatever may come. Download the USDAC’s Art Became The Oxygen: An Artistic Response Guide to learn more. Working with a team of four, you should be able to make a great deal of progress meeting two hours or less every other week. Design your own starter project. 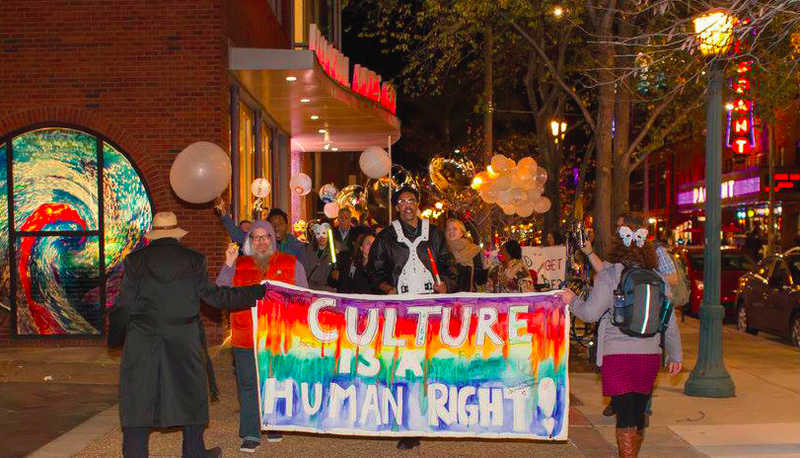 If you already have a cultural organizing project in mind, let us help you and your fellow Outpost members find models, allies, and support in the USDAC’s national network of 12,000+ Citizen Artists. Or explore USDAC Toolkits and Guides for ideas from your own Super PAC to #DareToImagine Imagination Station to HI-LI projects. All you need is a goal and a timeline for achieving your first milestone. Let us help you! Download the Outpost Toolkit for information on more great projects your Outpost can take on: serving as a learning and action community, bridging artists and creative organizers to other sectors and interests in your community; providing arts-based skills for community planning and action; or mounting a policy initiative to address key cultural issues.